This post has been originally published on Oct 26, 2016 and has been extensively revised and updated on April 23, 2018. We all know how important is it to have a top-class resume to deliver to your prospective employer or company recruitment officer, but many job seekers tend to forget how crucial it is to back up your resume with a solid cover letter. 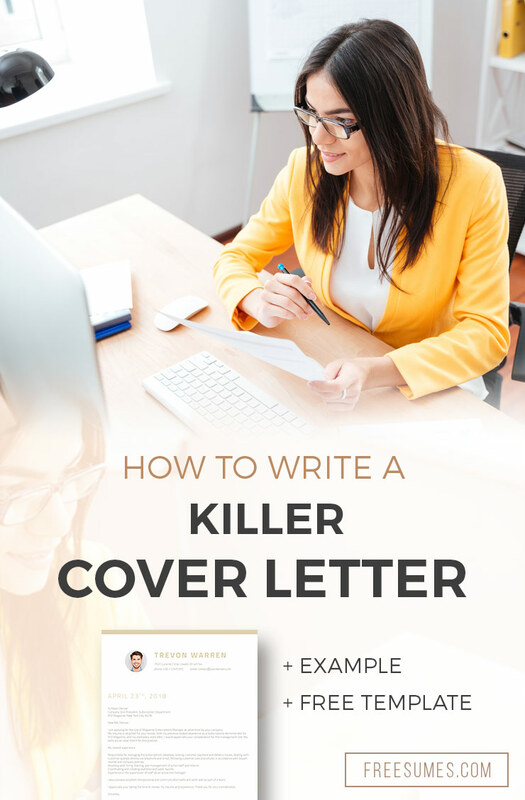 A killer cover letter will also help you stand out from the crowd when employers are sorting through their list of prospectives. Many people also make the huge mistake of keeping a generic cover letter on file and sending it to multiple employers without a second thought. Big mistake! It would come as no surprise to find most people have sent out the same cover letter to prospective employers at one point or another. This is especially true if you have been looking for work or trying to change career for some time. We all tend to get a bit weary of the constant application process over time. Harsh as it may sound, the reality is that neglecting your cover letter can lose you that job, no matter how good your resume is. Many people think that your resume showing your skills, qualifications and work experience should be enough. Sadly this isn’t true. Make sure you have an exceptional cover letter to back up your resume and you will be sure to stand out from all the other candidates. Employers have to wade through hundreds of applications to sort out their shortlist. Take your chance to show how perfect you are for the role and make it impossible for them to ignore you. If you are not a natural born writer, or even if you are, crafting a killer cover letter can seem hellishly difficult to achieve. Many people make the job more complicated than it actually is, so let’s take a look at how to simplify your cover letter writing. So how exactly do you convey these three points in your one page cover letter? Start out strong and to the point. You need to grab the readers attention, so anything wishy-washy or too vague will be very boring to read and will see your letter consigned to the bin in the first 15 seconds of reading. The first sentences of your letter are the most valuable. Don’t beat around the bush here – launch straight into why you are perfect for the job. Once you have your reader hooked, you can then move on to convincing them that your skills and experience are a perfect fit for the role. Most businesses will have their own company language and this is usually reflected in the chosen wording of their job advertisements. You can use this to your advantage by mirroring the language used in the advertisement as much as possible to show how your skills match perfectly with with their needs. For example, if you previously worked as a ‘content writer’ for a company, but this firm calls it ‘copywriting’, then you should also call it copywriting. You are more likely to get noticed if you already speak the same language as the company does! Your killer cover letter serves the purpose of demonstrating why you are a good fit for the job in hand, but you don’t want to come across as some sort of unfeeling robot. Employers hire people on a combination of both their skills and their personality. They like to hire people that they can get along with and be able to work well with others. By making your letter conversational in tone and not overly formal, you can demonstrate that you are friendly and approachable. This will add a good feeling to your cover letter that will make it shine. The key to a killer cover letter is making the employer want to meet you. Steer-clear of those classically overused catchphrases that recruiters see over again in generic cover letters and you should easily stand out from the crowd. Try to avoid phrases like: “I am passionate about…”, “I am a team-player”, and “I am a fast learner.” Believe me, these phrases litter most cover letters and are so overused that employers can go cold at the sight of them. If you see a job that is worth applying for, always thoughtfully tailor your cover letter to suit the language being used. Avoid boring the reader to death, and inject a bit of your personality to get yourself noticed in a sea of cover letter mediocrity. You can do it! Why do we need a cover letter? 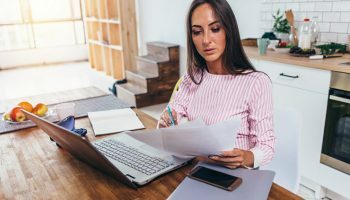 While you think that adding a cover letter to your resume is an extra time-consuming task, you may wonder if you can get away with just sending your resume without one. 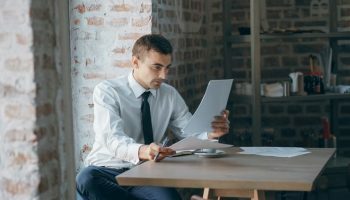 However, in most cases, especially when you are applying for a job in a competitive industry, a good cover letter will greatly help to boost your chances of getting through to the interview stage. Done correctly, your cover letter will help to highlight your most valuable skills and experience for the job in hand, and can make all the difference between making it to the ‘yes’ pile for short-listing for interview, or being rejected. Your cover letter is a great opportunity to deliver key information to the employer without them having to search your resume for it. What you should make sure to include in your cover letter is your previous experience that directly relates to the job that you are applying for. This instantly shows the employer that they have a candidate that can hit the ground running. Remember to keep your cover letter short and sweet. You don’t want to overload the employer with too much information, especially if it repeats what they will find in your resume. Three to five paragraphs is sufficient, but make sure each paragraph is targeted to a different aspect of your application. Go through the job description and search for key words and phrases. This is what the employer is looking for in a candidate, so you should make your cover letter answer their requests. If they want a candidate with sales experience, tell them in your cover letter that you have sales experience. A well written cover letter can have a very positive influence on an employer – but don’t forget that the opposite is also true! A poorly constructed cover letter isn’t going to win you any friends, so keep it on point and relevant. Avoid making your cover letter too long. An employer can be very put off when they see a very lengthy cover letter with huge blocks of text for them to wade through. Cut any unnecessary waffle. Your cover letter is not the place to tell an employer that you are the president of the narrow-gage model railway society, or captain of you basketball team. Keep everything you include in your letter relevant for the job on offer. Here we have prepared an example of a cover to give you an idea about how to write your letter. You can use this example to guide your writing, or you could choose to use the free cover letter template that is all ready for you to edit with your own information (see below). Cover letter applying for the post of a Magazine Subscriptions Manager. I am applying for the role of Magazine Subscriptions Manager as advertised by your company. My resume is attached for your review. With my previous related experience as a Subscriptions Administrator for XYZ Magazine, and my exemplary work ethic, I would appreciate your consideration for this management role. My skills are an ideal match for this position. Responsible for managing the subscriptions database, solving customer payment and delivery issues, dealing with customer queries directly via telephone and email, following customer care procedures in accordance with departmental and company policies. Assisting with hiring, training, and management of junior staff and interns. Coordinating and collating statistics and sales reports. Experience in the supervision of staff as an active line manager. I also possess excellent interpersonal and communication skills and work well as part of a team. I appreciate your taking the time to review my resume and experience. Thank you for your consideration. 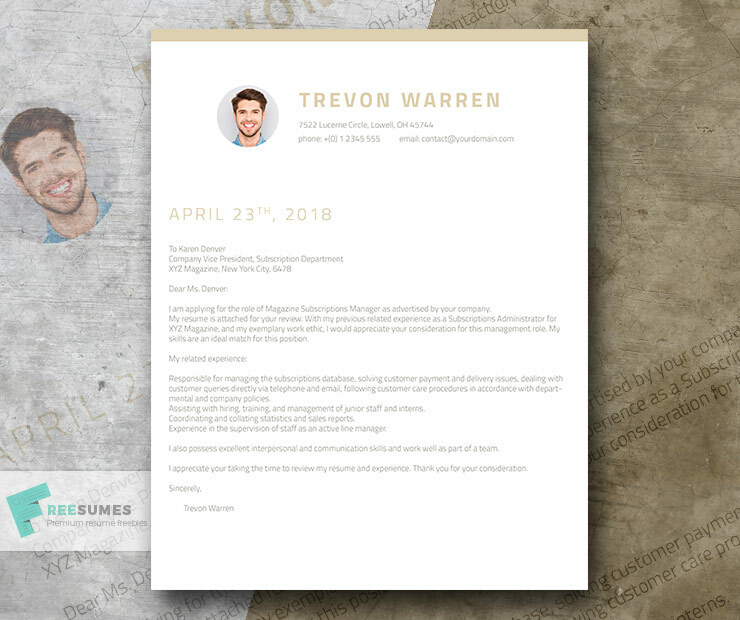 To save you a lot of time with your cover letter preparation, we have created a well-balanced Cover Letter Template for you to use. This template has been created in MS Word and is completely customizable. Simply download and edit our professionally designed Cover Letter Template with your own personal information. Remember to tailor the text in your template to reflect why you should be selected for this job interview. Need a matching resume design? Get the free Champagne & Wine resume template here. On a final note, take extra care to thoroughly proofread and edit your cover letter. Look for easy to miss typos and grammatical errors that can make your letter look sloppy. Wherever possible, get at least two other friends or family members to look over your cover letter for any minor mistakes that you may have missed. If you don’t have anyone free that can look over your cover letter for you, then check out Grammarly . Grammarly can be your second pair of eyes when you need to make sure your cover letter is absolutely perfect. It scans your text for common and complex grammatical mistakes, then offers accurate, context-specific suggestions to further help improve your text where necessary. Thanks for this resource, it’s been helpful.